Google Maps can be an incredibly cool thing. Or it can be a total stalkery thing. It all depends on perspective and usage, I suppose. In some situations, it can be a great way to virtually visit places all over the world. Want to see what the ocean looks like up close or stand in the middle of Russia's Red Square? Google has that covered too. 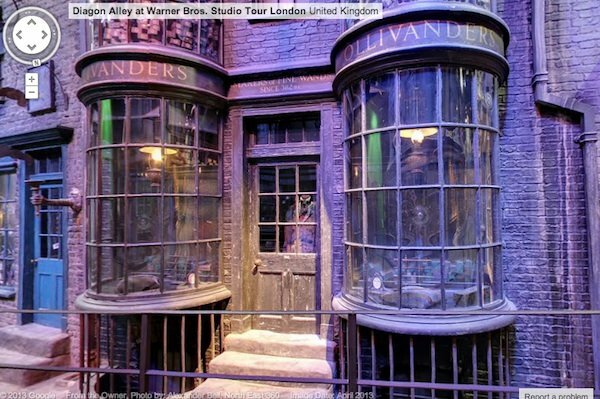 And in a more movie-related development, those who wish they could walk down Harry Potter's Diagon Alley might find the next best thing via Google Maps, at least until Universal Orlando gets their expansion up and running. 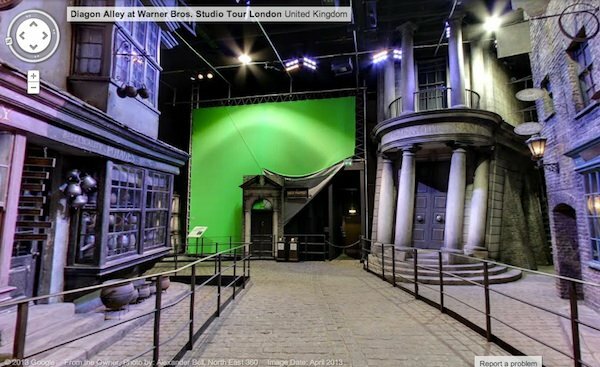 Checking out the Street View of Diagon Alley at Warner Bros. 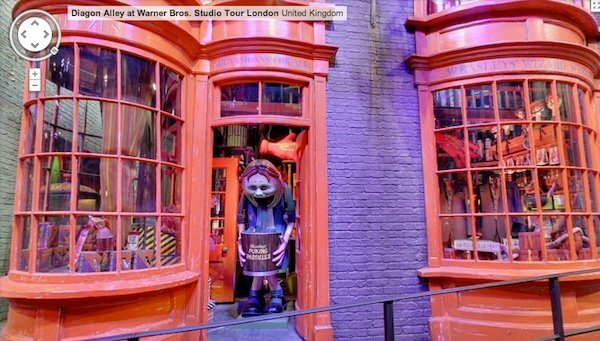 Studio Tour London on Google Maps will take you right onto the magical street, no brick-tapping required! 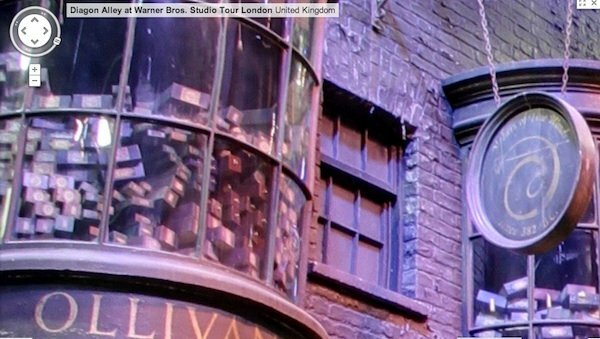 Of course, a trip into Diagon Alley would probably be even more enjoyable with a pint of butter beer from the Leaky Cauldron warming up your belly, but in absence of the real thing, the Google Map feature gives us a tour of the street. At first glance, I figured it was just one or two angles, but you can actually inch your way down the street for an impressively sharp tour of the shops, and you can zoom in to see some of the fantastic details. And check out the windows upstairs. They're cluttered with wand boxes! 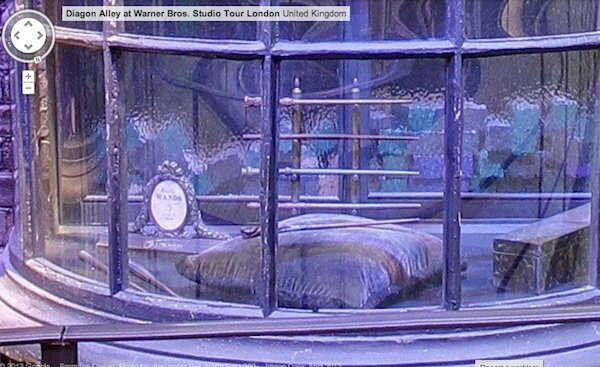 The front of the tour shows us Gringotts Wizarding Bank and the office to the Daily Prophet (set against a green screen). 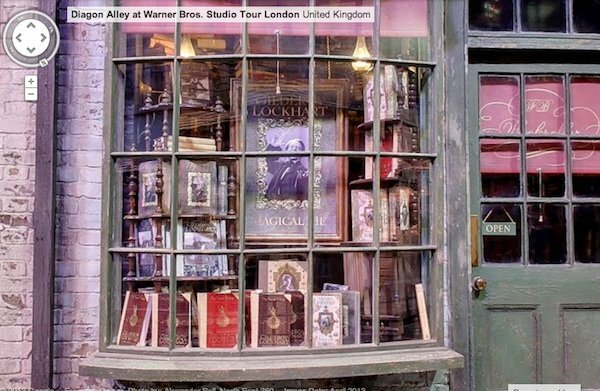 And don't forget to bask in the glow of Gilderoy Lockhart, whose likeness and books are stacked in the window of Flourish and Blotts! These are just some of the things you can spy as you "walk" through the Alley. There's also Eeylops Owl Emporium, Madam Malkin's Robes for All Occasions, Slug & Jiggers Apothecary and Quality Quidditch Supplies. Diagon Alley really does have everything an active witch or wizard might needs, doesn't it? Unless that wizard practices the dark arts, in which case they'll want to go to Knockturn Alley. Of course, this is a Diagon Alley frozen in time, referencing more than one book in the series, as Fred and George didn't set up shop there until later in the series, and Lockhart wasn't introduced until Chamber of Secrets. But looking at the street recalls one of the better scenes in the first film, when Hagrid takes Harry on his first trip to the secret magical spot so he can stock up on all of his school supplies. Just watching the above video makes me want to read the entire series all over again. It might be time.